6.80 points at 15 votes (rank 407). In Gold Quest III - The Forest of Doom the green dwarf named Sledgie and his friend Dave go on a trip the master their third adventure. This time they have to - next to collecting diamonds, gold and treasure chest - free the kidnapped dwarf girl Dworina. The game consists of three chapters with each one end boss. First they need to defeat Hotzenplotz in his cave. Then they go for the enchanted graveyard and the evil guard and finally Dracula has to be defeated in the forest of perdition. The background graphics and many sprites have beeen refined in the third part of Gold Quest. The game was programmed with the help of SEUCK. The music and the title screen were inserted subsequently by Richard Bayliss. "Dave" (blue) has 3 lives at the start, "Sledgie" (green) starts with 5 lives. You choose at the start of the game by pressing fire button on joystick 1 or 2. 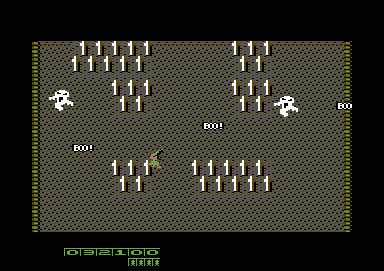 "Dave" and "Sledgie" follow the joystick movement, by pressing fire you shoot into the direction of movement (also diagonally). Shots can go through walls. Intermediate enemies do not need to be defeated, they also can be evaded. Unfortunately, there is no highscore list, end evaluation or proper ending in this game. Load the game, but don't RUN. Home the cursor and enter BEER as the first 4 chars. Now leave enough space and enter RUN. The game will first decrunch and then you'll be presented with a message informing you that the cheat mode has been activated. "Sledgie and Dave are then immortal, invulnerable, can walk through walls and over water!" 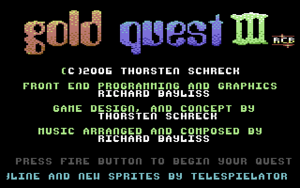 Richard Bayliss: "I played Gold Quest III on my real C64 a few times and I really enjoyed it. It is not too hard to play, and then again it is not too easy either. For me the difficulty curve was just absolutely right." Sith-Smasher: "Nice, I'll give it a go." loflo: "Not bad at all. Nicely pitched difficulty level. Good music. I quite liked it." 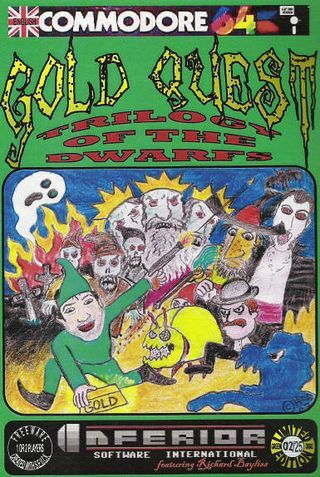 Cover of the collecion Gold Quest - Trilogy of the dwarfs with all parts of the Gold Quest - saga (incl. bilingual instructions). Scores achieved with the blue player Dave (joystick port 1) count more, as he has altogether only 3 lives. The green player "Sledgie" (joystick port 2) starts with 5 lives. Scores achieved in teamwork by "Dave & Sledgie" do not count. In the table scores are marked with "green" or "blue". The score report of Dave is on the right. This page was last modified on 5 September 2015, at 02:54.